Essential for protecting outdoor solar electrics and boat owners. 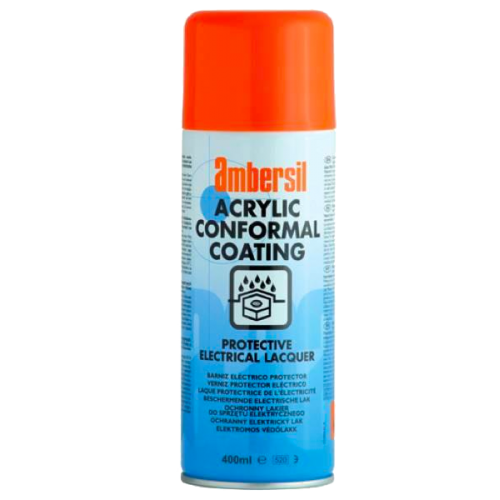 Once you have assembled your electrical connections spray this acrylic conformal coating on your connections to protect them from the elements and corrosion. It is essentially a lacquer which coats your connections and protects them from the elements. You can also open up electronic equipment and spray the circuits to protect them from moisture and salty atmosphere. In the past we've had problems of old connections getting corroded and then over heating when under load, but with this coating this could not happen as they are protected from corrosion. A low viscosity, solvent-drying, acrylic based conformal coating with excellent insulating properties. The lacquer is transparent and flexible. It has a durable adhesion in the temperature range from -40°C to +60°C and can be used for a short period of time up to +100°C maximum.